Here's where to find all five golden Hercules figures in Olympus. 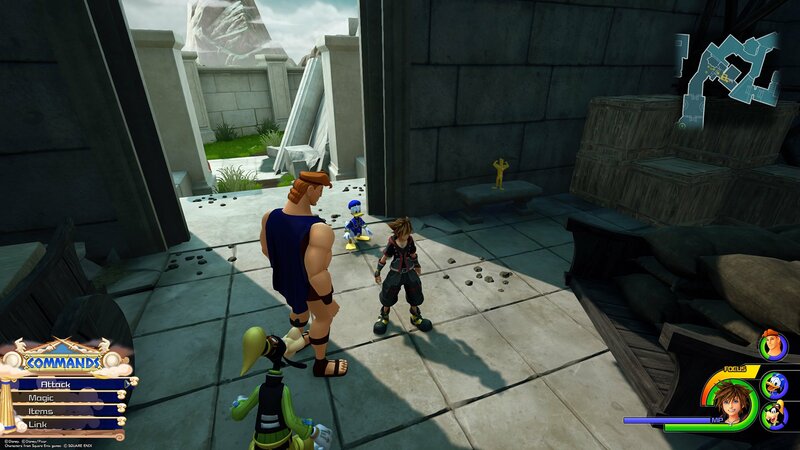 The first time you play through the world of Olympus in Kingdom Hearts 3, you may notice the small action figures of Hercules scattered throughout the world. 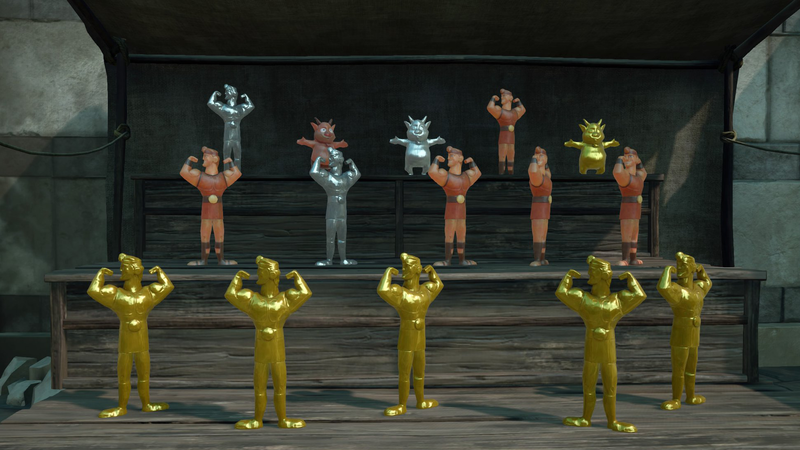 On a return visit to Olympus, five of these figures will have been replaced by golden ones, which you can collect and trade to a child in Agora for a Hero’s Belt. Our video guide below will show you where to find all five Golden Herc Figures in Olympus. If you’d prefer, keep reading to see a picture and text description related to finding each one. Special thanks to Prima Games for finding the locations of all five figures. From the Agora save point, run through the courtyard and climb the set of stairs to the right of the large fountain to go into “The Big Olive” section of Thebes. Turn left and climb another set of stairs to reach an area called “Alleyway.” Turn right at the top of the stairs to go into the building that’s under construction. The first Golden Herc Figure is on the floor next to three blocks in the back-left corner of the building. There’s a bit of a trek between the first and second golden Hercules figures. From the first figure, run to the Gardens area of Thebes, where you’ll find three holes in the ground. The second figure is in the deepest hole. 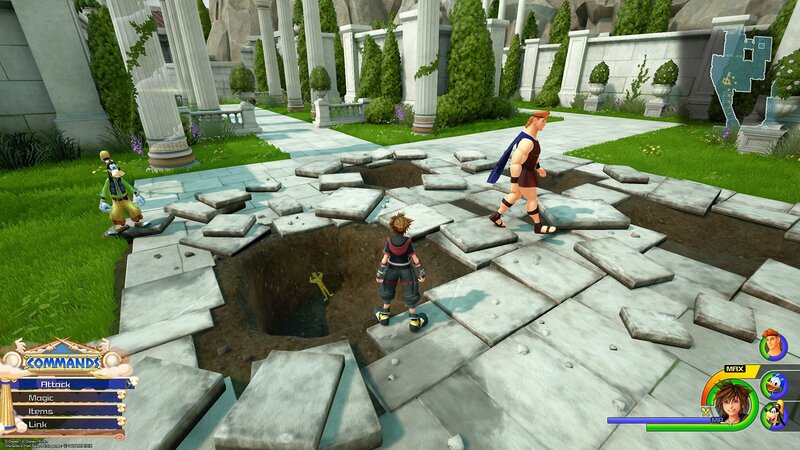 Note: If you decided to fast-travel to the Gardens save spot rather than run through Thebes, turn right from the save spot and run down the stairs to find the area with the holes in the ground. After collecting the second figure, run up the stairs toward the Gardens save spot. Keep running through the Gardens until you see a wall blocking the path ahead of you. Take a right turn and climb a short flight of stairs to enter a ruined building with scaffolding on the left side. Once inside the building, turn around and you’ll find the golden Hercules figure on a bench against the wall near the doorway. Once you’ve picked up the third figure, leave the building and turn right to climb the wall into the “Overlook” area. 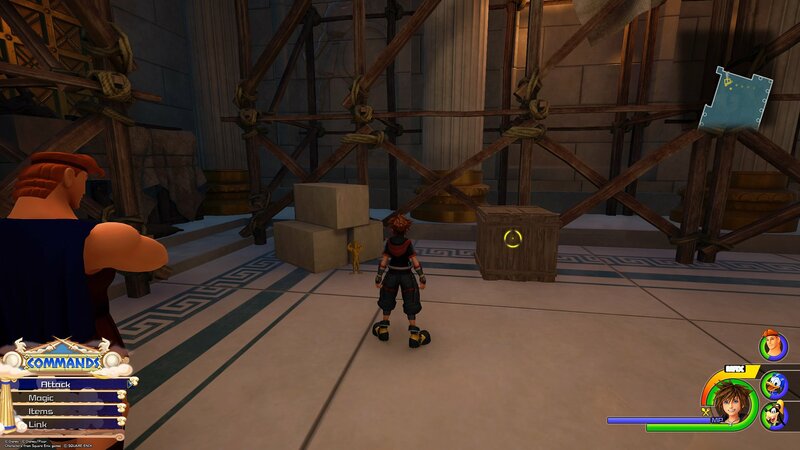 Follow the path through this area until you reach the dead end with two large, golden statues next to a tall wall you can climb on Sora’s left. 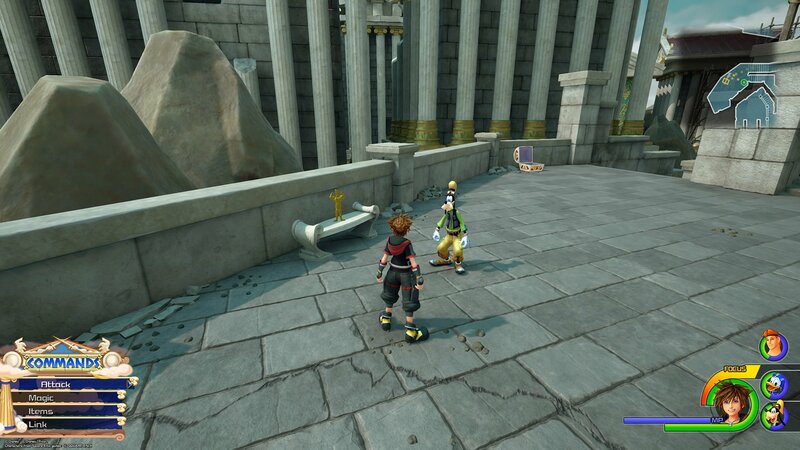 For reference, you’ll pass a large courtyard where Heartless spawn on your way through the area. Once you climb the wall, make your way across the first of the two red rooftops and stop. Turn around so that you’re facing the area you just came from. Slide down the red rooftop you just crossed and jump off to land on a giant stone shield being held by a huge statue. The fourth figure is laying on top of the shield next to some large rocks. After grabbing the fourth figure, jump off of the shield toward the large wall you climbed to reach the red rooftops for Figure No. 4. Climb back up to the rooftops, but this time cross both of them and continue following the path toward the Overlook save spot. When you make it to a courtyard where Heartless spawn, turn right and climb the stairs to reach the landing with the save spot. 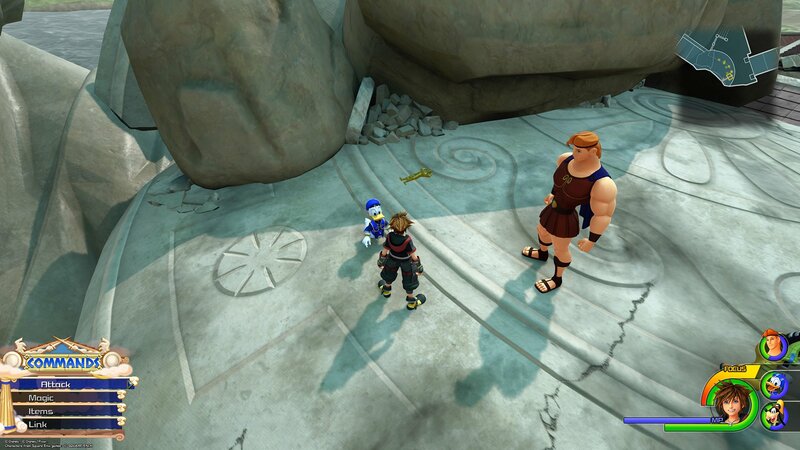 The final Hercules figure can be found on a bench diagonally across from the save point.